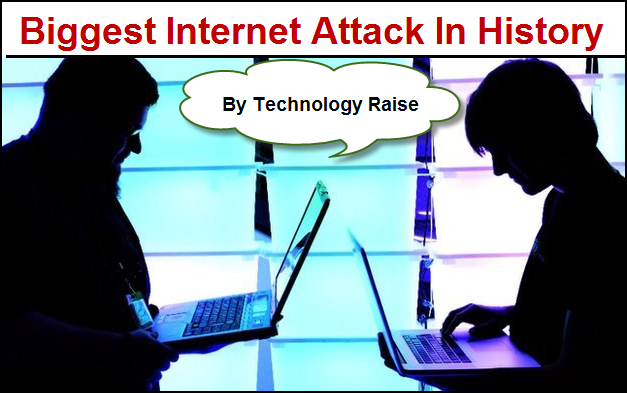 Biggest Internet Attacks In History. Cyber space a fast growing community where each one of us can reach out to one another despite of distance and time. We have adopted a new way of life and its negative repercussions also. Some individuals use the cyberspace for their own unlawful schemes, as they target innocent individuals, firms, banks and even government agencies. Internet users worldwide had to suffer slow connections after the biggest cyber-attack in history and you must have noticed that some websites have been slow and the reason for that was a distributed denial of service (DDoS) attack launched against spam-fighting organization Spamhaus, this attack had an impact across the world and has been termed as the biggest cyber-attack in history. A Dutch web host named Cyberbunker was recently blacklisted by Spamhaus following this incident the anti-spam organization began to get bugged with a large-scale DDoS. The attack was at such a density that was enough to knock down even government infrastructure. By using techniques like DNS reflection, the attackers slammed Spamhaus for more than a week. Such Cyber attack can jam vital infrastructure all around the world. The arrested Dutch citizen in northeast Spain was accused of suspicious launching what was stated as the biggest cyber attack in Internet history operated from a bunker and had a van capable of hacking into networks anywhere in the country. He was using his van as a mobile computing office, prepared with various antennas to scan frequencies, after his arrest the suspect addressed himself as a diplomat belonging to the "Telecommunications and Foreign Affairs Ministry of the Republic of Cyberbunker. A laptop and internet connection was all he used and this method is known as amplification, the largest assault clocked in at 300 billion bits per second. The attack functions by making an enquiry or pinging, to a DNS, or name server. As a result the server then sends back an answer with perhaps 100 times more data than the original query it originates by spoofing your computer as an initiator so that the “answer” goes to a different target. As an effect of this attack few had complained that the internet was more than usually sluggish, the best part of the attack was that it was targeted form over a week, the attack was investigated by five different national cyber-police-forces around the world. The tactic used for the attacks was known as Distributed Denial of Service (DDoS), which intrudes into any systems and floods the proposed target with large amounts of traffic in an attempt to leave it unreachable. It was said that normal attacks on banks were targeted at 50Gbps but this was at around 300Gbps causing a major clogging. Sources claimed that the largest attack earlier witnessed was at 100 Gbps. They are targeting every part of the internet infrastructure that they feel can be brought down; they were actually targeting every part of the internet infrastructure that could be brought down. Spamhaus got hit with a big attack, but it survived and that was because of the help of security company CloudFlare, the service that had remained up and functional, for the most part and it balanced the incoming traffic to 23 different data centers across the globe, the attack was effectively dilute. The attack on Spamhaus was huge because the organization had spread its infrastructure over 20 countries. Cyber security experts are calling the attack a major alert for service providers to secure the world’s vulnerable DNS servers. CloudFlare the hosting company that fought against the attack observed that the attack showed that the intruders were controlling the power of several servers and was targeted to almost break down the internet. But luckily the attack was defeated with a major thought provoking question that the vulnerability of such attacks should be destroyed immediately. Cyber Attacks and Cyber-crimes would always be there in the headlines, all we can do from our end is be alert and try not to unleash such unlawful strategies in the coming future. With a wish that every individual be safe and healthy worldwide, I thank you all to spend your precious time visiting us and reading this articles.